The H1N1 swine flu epidemic appears to be losing steam, but experts are looking ahead to try to predict how the virus may affect next year’s flu season. The World Health Organization announced this week that the number of swine flu cases worldwide could reach 2 billion if the outbreak continues to spread and lasts two years. And because influenza tends to thrive and spread more rapidly in colder, less humid environments, it makes sense that this particular strain of virus may subside during summertime in the United States, just as seasonal flu does, and return in the fall and winter. 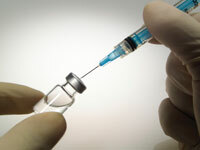 FRIDAY, May 8, 2009 (Health.com) — The H1N1 swine flu virus appears to be less deadly than initially feared, but experts are looking ahead to try to predict how the virus may affect the fall flu season. The World Health Organization announced this week that the number of swine flu cases worldwide could reach 2 billion if the outbreak continues to spread and lasts two years. And because influenza tends to thrive and spread more rapidly in colder, less humid environments, it makes sense that this particular strain of virus may subside during summer in the United States, just as seasonal flu does, and return in the fall and winter. This possibility has the WHO and the Centers for Disease Control and Prevention considering several options for vaccine production and distribution, and weighing carefully the worldwide demand for vaccines for both swine flu and seasonal flu. New strains of influenza often show up toward the end of flu season and cause a mild spike in flu cases, only to re-emerge months later as the temperature drops. In historic cases such as the 1918 Spanish influenza epidemic, the latter outbreak was larger and more dangerous. That could be the case with swine flu, as well. No one can truly predict what will happen because influenza strains typically mutate over time. However, at least some leading experts believe that the swine flu virus, even if it does re-emerge in the fall, won't pose a huge threat. Paul Offit, MD, a virus and immunology expert at the Children's Hospital of Pennsylvania in Philadelphia, believes that the CDC and WHO have learned a lot about this particular swine flu strain thus far and that it appears to be a particularly mild strain—which is encouraging even when looking months down the road. Scientists are prepared now more than ever to pick up on new flu strains and predict their behavior, he explains, thanks to infrastructure put into place during avian flu scares in recent years and more research on influenza in general. "There's no way to know for sure, but I predict that this strain will not rear its head in a much more virulent form—that it will not cause a lot of hospitalization and death—and that we will have learned something once again," Dr. Offit says. This constant learning process, and the government’s just-in-case mindset, can be frustrating and scary to the public, says Dr. Offit. But it's necessary to prevent a worst-case scenario. In early 1957, for example, U.S. scientists pushed forward a vaccine for a new flu strain spreading through Asia. The same strain did indeed enter North America that fall and the death toll was considerable, but the vaccine saved tens of thousands of lives. The thought of swine flu spreading at the same time as seasonal flu—which in itself can be deadly to at-risk populations such as the elderly and young children—can seem like a dangerous situation. But in reality, it's not much different than what goes on every fall and winter, says Pascal James Imperato, MD, dean and distinguished professor of public health at the State University of New York Downstate Medical Center. "It would be sort of normal circumstances, because frequently during flu season there is more than one virus circulating and causing illness," says Dr. Imperato, who was chair of the New York City task force on swine flu during the 1976 outbreak at Fort Dix military base in New Jersey. "That's why even a normal flu vaccine usually contains protection against three different strains. If swine flu was added to the mix, it would not be that unusual." The only real question, he says, is whether the government should provide vaccine for all of these strains in just one dose or in separate doses. Including swine flu elements in the seasonal flu vaccine—either by replacing one of the strains usually present or by adding a fourth strain to the formula—would be the most convenient option for the public. But people with memories of the 1976-'77 swine flu scare may be hesitant to be inoculated with a swine flu vaccine. At that time, a vaccine was rushed into production and more than 40 million people received it. However, there seemed to be a higher-than-average incidence of Guillain-Barré Syndrome—a rare, one-in-a-million side effect that causes serious but treatable paralysis—associated with that vaccine. "Even though our vaccine production methods are so much better today and it's unlikely that there would be a repeat of the problem, it would be an issue of public perception," Dr. Imperato says. Experts are also studying whether one dose of vaccine would be enough to protect against this new flu; some evidence suggests that two doses might be needed. If this turns out to be the case, the government may recommend the vaccinations be produced separately, and that people get three shots: one to protect against seasonal flu, and two to protect against swine flu. "This may be the way that offers the best protection, but of course it presents its own challenges," Dr. Imperato says. "Will people be willing to get three shots? Will they forget which ones they've already had? And if the swine flu virus turns out to be fairly mild in the beginning of the fall, will people be tempted not to bother getting extra vaccinations?" Will there be shortages of seasonal flu vaccines? Some experts have also expressed concern that if pharmaceutical companies devote efforts to producing a separate swine flu vaccine, they will have to curb production of seasonal flu vaccine and the United States would face potential shortages. The WHO, however, says it won’t. They say they won't halt current production of seasonal vaccine and will determine how to produce and distribute both vaccines safely and effectively, if necessary. Either way, the process of manufacturing a new vaccine will take time: The chosen flu strains are injected into chicken eggs, incubated for several months, and then deactivated, extracted, and blended into a vaccine. Luckily, because the CDC has already started identifying the strains of both seasonal and swine flu that could be used in vaccines, production could be complete by the start of flu season, around September. Dr. Offit is confident that, thanks to better-than-ever production facilities, enough vaccine will be available come flu season. "We've continued to increase the number of groups who should receive the shots, and I think we're moving toward universal recommendations for everyone," he says. "And as we've increased recommendations over the last few years, we've really ramped up production and have gradually shoehorned ourselves into making more and more." "In terms of a pandemic flu vaccine—if the swine flu vaccine were given as a second [and third] shot—it wouldn't be a question as to whether there's enough," he says. "It would be a question as to whether it's still the same virus between now and then." Because pandemics—the rise and wide circulation of a new virus—typically occur every few decades, most experts say we’re overdue for one. (The last was Hong Kong flu in 1968-'69.) However, recent flu pandemics have been relatively mild—unlike 1918 Spanish influenza that killed 50 million people worldwide. Dr. Imperato is quick to point out the differences between 1918 and the present; we are now much better equipped to pick up on a dangerous virus, and treat people who get it. "We are in a much better position to deal with those eventualities," he says. "We can quickly and effectively produce vaccines, and we also have antiviral agents such as Tamiflu." Dr. Offit agrees. "Even 20 years ago, I think this outbreak in Mexico would have largely gone unnoticed," he says. "Today, we can very quickly identify strains anywhere in the world with pandemic potential—and that means we can get to work sooner on learning how the virus behaves and working on a vaccine." Still, with any type of influenza, the expected sometimes doesn't occur—and the unexpected does, Dr. Imperato says. "So one wants to be prepared for the worst eventuality and hope that the mildest arises." Can You Catch the Flu and a Cold at the Same Time? Why Do Some People Die From the Flu? The Nasal Spray Flu Vaccine May Be Less Effective Than the Shot—so Should You Get It?